- Jointing can be done during any time of the day under any weather conditions. - Faster installation, immediate pressure testing and commissioning possible. 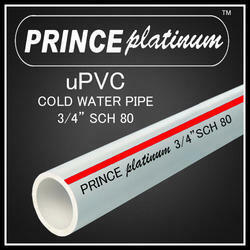 Raghushree Rigid U PVC Pipes are manufactured confirming to IS 4985. They are light in weight, easy to handle and instal with free flow properties. Ideal for transportation of water and other liquids. With our in-depth knowledge of this domain, we are actively engaged in manufacturing an excellent quality range of UPVC Pipe. Diameters in: 4, 6, 8, 10 and 12.5 kgf/cm2 working pressure.